Article détaillé : Les Chroniques de San Francisco. ↑ a et b (en) Armistead Maupin, UNC and Campus Y alumni, receives honorary degree. Sur campus-y.unc.edu. 05 décembre 2014. ↑ (en) Leilani Labong. Author Armistead Maupin cleans out the closets. 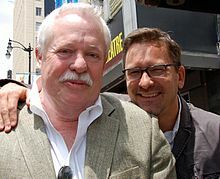 Sur armisteadmaupin.com. 02 juin 2007. ↑ a et b Armistead Maupin in conversation with K.M. Soehnlein. Sur sfpl.org (site de la Bibliothèque municipale de San Francisco). ↑ (en) How Armistead Maupin’s remarks at closing ceremony of #GayGames IV foretold the conclusion of Tales of the City. Remarques à la cérémonie de clôture des Gay Games IV au Yankee Stadium, June 25, 1994. Sur gaygames.org. ↑ a et b Armistead Maupin au National AIDS Memorial Grove dans le Golden Gate Park de San Francisco. ↑ (en) Audio interview about Maupin's New Zealand home. Sur web.archive.org, 3 août 2004. ↑ (en) The First Couple: Don Bachardy and Christopher Isherwood. Armistead Maupin interviews Christopher Isherwood pour The Village Voice, vol. 30, no 16. ↑ (en) Foreword to The Isherwood Century (Introduction au 'siècle d'Isherwood'). Sur Web.archive.org, 5 mars 2006. ↑ (en) Tom Beer. Armistead Maupin: The quick-witted author mined his own experience for The Night Listener, interview. Sur timeoutny.com. 03 août 2006. ↑ (en) Christopher Turner. Five Questions for Christopher Turner: Daddy-hunt site entrepreneur knows of which he posts. San Francisco Chronicle, 17 juin 2007. ↑ (en) Kemble Scott. Armistead Maupin’s Family Ties (archive). Publishers Weekly, 23 avril 2007. ↑ Une voix dans la nuit. ↑ (en) Armistead Maupin . Sur imdb.com. ↑ (en) Armistead Maupin – The Night Listener: Product Features. Sur dealtime.com. ↑ It’s here and it’s queer!. Sur bbc.co.uk. 27 novembre 2014. ↑ (en) David Ward. Chronicler of San Francisco wins best gay read award. Dans The Guardian, 11 mai 2006. ↑ (en) Sue Gilmore. Maupin Up for Another Award. Dans San Jose Mercury News. 05 août 2007. Ce document provient de « https://fr.wikipedia.org/w/index.php?title=Armistead_Maupin&oldid=156484820 ». La dernière modification de cette page a été faite le 5 février 2019 à 10:55.